180 Gram Vinyl - items 250 to 275 Shop MyMusicFix!! 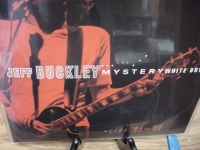 "Jeff Buckley, Mystery White Boy - 180 Gram Double LP"
"Jefferson Airplane, After Bathing at Baxters - 180 Gram - Mono - CURRENTLY SOLD OUT"
"Jefferson Airplane, Surrealistic Pillow (Mono) 180 Gram"
Classic Analog LP MONO Pressing "Heavy Quality Sleeve" Tracks Include: "She Has Funny Cars" "Somebody To Love" "My Best Friend" "Today" "Comin' Back To Me" "3/5 of a Mile in 10 Seconds" "D.C.B.A.-25" "How Do You Feel" "Embryonic Journey" "White Rabbit" "Plastic Fantastic Lover"
"Jefferson Airplane, Takes Off - 180 Gram - Mono"
JEFFERSON AIRPLANE - TAKES OFF- THEIR DEBUTLP IN Mono 180 Gram Limited Edition classic LP high-definition Virgin Vinyl pressing for superior fidelity. 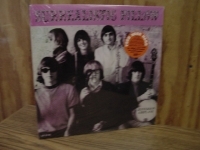 COLLECTORS NOTE: THESE ARE SUNDAZED 1ST EDITION HEAVY VINYL 180 GRAM LP'S WITH ORIGINAL STICKERS. SUNDAZED RECORDS IN THESE LIMITED EDITION 180 GRAM WEIGHTS ARE NOW IN THE 150 GRAM WEIGHT IN THEIR 2ND GENERATION PRESSINGS. THESE ORIGINAL 180 GRAM PRESSING WILL BE WHAT COLLECTORS SEEK AND YOU SHOULD NOT MISS OUT ON THESE 1ST EDITIONS. This is our last of these limited edition 180 gram pressings. Don't miss out on the rare heavy vinyl 180 gram pressing. Jefferson Airplane's "Jet Age Sound" reverberated throughout the ballrooms of San Francisco in 1966. Here, for the first time in nearly four decades, is their stratosphere-shaking debut album in its original uncensored form, taken from the original RCA Victor mono masters. -------------------------------------------------------------------------------- Track Listings 1. Blues From an Airplane 2. Let Me In 3. Bringing Me Down 4. It's No Secret 5. Tobacco Road 6. Runnin' 'Round This World 7. Come up the Years 8. Run Around 9. Let's Get Together 10. Don't Slip Away 11. Chauffeur Blues 12. And I Like It This MONO reissue was re-mastered from the Original Analog Tape, unearths hidden details you have never heard before. 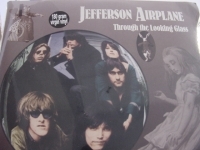 "Jefferson Airplane, Through The Looking Glass (2 LPs)"
180 Gram Limited Edition Analog Virgin Vinyl. Tracks Include: "Night Flyn' Bird" "Today" "She Has Funny Cars" "Don't Slip Away" 'Plastic Fantastic Lover" "3/5 Of A Mile In 10 Seconds" "Ride". 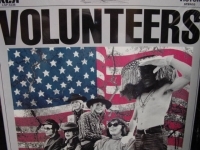 "Jefferson Airplane, Volunteers - Last Copy"
180 Gram Limited Edition Analog Virgin Vinyl. Tracks Include: "We Can be Together" "Good Shepard" "The Farm" "Hey Frederick" SIDE TWO: "Turn My Life Down" "Wooden Ships" "Eskimo Blue Day" "A Song for All Seasons" "Meadowlands" "Volunteers"
"Jethro Tull, Aqualung - 180 Gram"
JETHRO TULL - THIS WAS - THE MILLENNIUM VINYL COLLECTION SERIES - MORE THEN A DECADE OUT OF PRINT PRESSED IN THE U.K. is 180 Gram Heavy Vinyl Limited Edition pressing. ORIGINAL PACKAGING - AUDIOPHILE PRESSING - HEAVY QUALITY SLEEVES - ANALOGUE CUTTING FROM ANALOGUE TAPES COLLECTORS NOTE: THIS LIMITED EDITION REMASTERED ORIGINAL PACKAGING 180 GRAM PRESSING WAS APART OF THE 1999 MILLENNIUM SERIES THAT HAS NOW BEEN OUT OF PRINT FOR OVER A DECADE NOW. 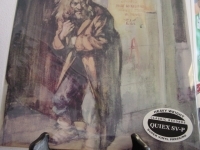 MYMUSICFIX HAS SEARCHED ALL AUDIOPHILE SITES AND THIS IS THE LOWEST COLLECTORS PRICE IN THE WORLD FOR A STILL SEALED COPY IN COLLECTORS CONDITION WITH NO STORES STICKERS EVER ATTACHED. YOU WILL BE ONE OF THE LAST PEOPLE IN THE WORLD TO OWN THIS 1ST EDITION 180 GRAM PRESSING OF THIS TITLE. 1. My Sunday Feeling 2. Some Day The Sun Won't Shine For You 3. Beggar's Farm 4. Move On Alone 5. Serenade To A Cuckoo 6. Dharma For One 7. It's Breaking Me Up 8. Cat's Squirrel 9. Song For Jeffrey 10. 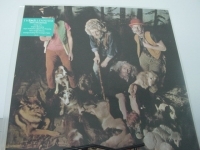 Round Debut albums are often the stuff of great discussion and controversy In the case of "This Was", Jethro Tull appeared on the music scene largely unheralded. Perhaps part of the reason was the many of the songs were strongly blues influenced and appeared at a time when blues were making a musical comeback, thus becoming somewhat lost in the flood of other music. It's also possible that the broad variation of musical styles, a characteristic of Tull throughout their history, made the album difficult to classify, and rather than deal with a group that fit no single category, reviews were lukewarm. Current reviews hail "This Was" for its creativity and for the eclectic collection of music that defied 1968 conventions. This album remains unusual, even considering all the albums that have been released since 1968. There are strong blues songs, Ian's rock/jazz/blues style of playing a flute, and flavors of rock and folk; clearly not a concept album, but a group of guys getting together and throwing what they had, which was very good, onto an album. The album kicks off with "My Sunday Feeling", a lament about the after effects of Saturday night. The flute in this song modifies the blues-rock guitar riffs and drums to provide a jazz twist. Ian's vocals could similarly be either blues or jazz. Regardless of how you classify the song, it's heartfelt and creative. "Some Day the Sun Won't Shine for You" is all blues, with an acoustic guitar and harmonica flavoring the song from the outset. The vocals have a classic blues sound to them that fit well with the acoustic instruments; a mellow breakup song advising the ex-girlfriend that some day she'll have a bad day. "Beggar's Farm" begins with a repetitive series of blues-flavored rock notes. 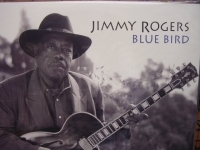 During the bridge the electric guitar and flute increase the blues flavor substantially. The theme here is a significant other with an outside relationship. The song advises her that she's going down in a bad way, and one day she'll end up on the beggar's farm, where perhaps he will see her (if she asks him nicely). It seems that Ian Anderson and Mick Abrahams were feeling down while writing these songs, as the next song, "Move on Alone", seems to indicate. Here the girlfriend has gone, and he's trying to overcome his grief to get on with his life. The blues instrumentation in this song is jazz-flavored with brass. The next two songs are instrumentals. The first, "Serenade for Cuckoo", sounds like a piece for a jazz combo, with Ian's flute providing a substitute for a horn. The lead guitar is playing blues, with mellow riffs. A very laidback piece. "Dharma for One" follows with a faster beat. While blues flavor this song as well, it is rock at heart. You can even hear elements of progressive rock in this song, including a portion that sounded to me a little like some of King Crimson's later style. The only strange thing about this instrumental is a drum solo that may have been a bit of 1968 experimentation on Jethro Tull's part. The next song is "It's Breaking Me Up", where the group moves into solid blues. This song joins the second track as the two most solidly blues songs on this CD. Ian plays the harmonica like a veteran blues man, and you might think you were in a New Orleans blues bar instead of listening to Jethro Tull. We jump from a classic blues song to a nearly psychedelic instrumental, "Cat's Squirrel". Each time I hear this piece I am reminded of early Black Sabbath. For much of the song the lead guitar and bass guitar pound out hard rock sounding riffs, and when the drums take off you could easily think you are listening to an early Black Sabbath recording; the heaviest cut on this LP. 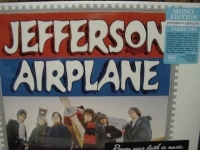 "A Song for Jeffrey" is the last song on the LP before the short instrumental "Round" (excluding the three relatively unnecessary "extra" tracks). Ian Anderson sings this song with a blues-like guttural vocal, yet the instrumentation backing Ian is rock, perhaps you could even consider this hard rock. "Round" finishes off the CD with a jazz sound, combining piano, drums and flute. The piece is short and to the point. There is a quote on the liner for this LP that states "'This Was' how we were playing then - but things change." Little did anyone realize how true that quote was when Jethro Tull was soon to release "Aqualung" and "Thick as a Brick", among others. More importantly, Jethro Tull was already experimenting with musical elements that would eventually be termed progressive, though this LP is more blues and jazz-flavored rock than progressive. Jethro Tull helped show the rest of the rock world that if you were brave, you could stretch the limits of what could fit onto a single album pretty far. This debut album helped define that this group had no definition, and has never needed one . JIMI HENDRIX - BLUE WILD ANGEL - LIVE AT THE ISLE OF WIGHT - MCA 3-LP Set is a piece of musical audiophile history of this classic recording. The authorized Hendrix Family Edition - Numbered Limited Edition 180 Gram Triple LP Set (Only Vinyl Pressing ever) - 18 songs - entire 120 minute concert - Includes 6 Rare unreleased performances - Features Full Color Booklet with rare photos and Liner Notes Jimi Hendrix' ISLE OF WIGHT concert of August 1970 was a historic occasion, it being his last major performance before his untimely death. He had returned to the country where he had skyrocketed to fame and gave his first performance in almost two years when he headlined the ISLE OF WIGHT Festival. Less than three weeks later, he would be dead. As such, it has acquired a mythic status over time. 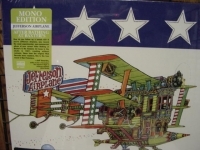 This triple LP Set marks the first complete release of Hendrix's set at the Festival, a warts-and-all recording that reveals a guitar legend in good humor, yet restlessly exploring the broader musical directions he'd just laid down on sessions for what would become FIRST RAYS OF THE NEW RISING SUN (initially released posthumously as FREEDOM). Backed by EXPERIENCE drummer Mitch Mitchell and BAND OF GYPSIES Bassist Billy Cox, Hendrix ranges from the improvisatory cacophony of "Machine Gun" and re-workings of his standard blues workouts "Red House" and "Hey Joe" to renditions of "Dolly Dagger," "Ezy Rider," "Freedom," and "Hey Baby" that trade on the more rhythmic R&B and jazz influences he'd diligently worked into his music. At times jagged, and straining the limitations of the trio format (Hendrix had publicly mused about working with a big band shortly before his death), it is nonetheless a passionate, intriguing clue as to Hendrix's true ambitions and potential beyond his initial hype and stardom. 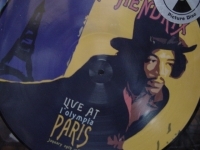 "Jimi Hendrix, Live At The L'Olympia Paris Jan.29,1968 - Last Copy"
180 Gram Limited Edition Picture Disc(Only 1000 Pressed). Tracks Include: "Killing Floor" "Experience The Blues" "Foxy Lady" "Red House" "Driving South" "The Wind Cries Mary" "Fire" "Little Wing" "Purple Haze." 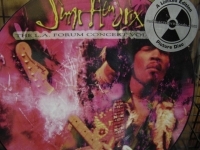 "Jimi Hendrix, Live At The L.A. Forum Concert Vol 1 v- Last Copy"
180 Gram Limited Edition Vinyl Picture Disc. Tracks Include: "Intro" "Tax Free" "Foxy Lady" "Red House" "Spanish Castle Magic." 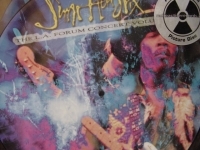 "Jimi Hendrix, Live At The L.A. Forum Concert Vol 2"
180 Gram Limited Edition Vinyl Picture Disc. "Star Spangled Banner" "Purple Haze" "I Don't Live Today" "Voodoo Chile" "Sunshine Of Your Love" "Voodoo Chile(reprise)." 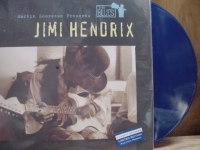 "Jimi Hendrix, Live In Copenhagen - 180 Gram Limited Edition"
"Jimi Hendrix, Martin Scorsese's The Blues (Blue Vinyl) - Out of Print 180g"
JIMI HENDRIX - MARTIN SCORCESE PRESENTS THE BLUES FACTORY SEALED 180 Gram Double LP in Blue Vinyl SET. IN THE ORIGINAL FULLY SEALED CLASSIC RECORDS PACKAGING WITH THE LIMITED EDITION BLUE VINYL STICKER ON THE FRONT. NOW TREMENDOUSLY RARE -THIS ITEM IS FACTORY SEALED THE PICTURE IS JUST TO SHOW WHAT THE BLUE VINYL LOOKS LIKE INSIDE THE SEALED TITLE. This is ONE of only a 1,000 copies ever pressed in this Limited Edition 180 Gram Blue Vinyl Analog Masterpiece and Out of Print with the only distributor that had any inventory is now totally depleted of this pressing. This will be one of the last listing ever on this title at this price. Don't Miss Out. "Classic Quiex SV - Super Vinyl" is a new vinyl formulation noticeably superior to all previous vinyl formulas used. The music on records made using Classic Quiex SV is more detailed, has richer harmonics and a more precise soundstage presentation Quiex SV is used exclusively and will have a sticker that identifies them as such.... This Heavy Vinyl LP has been critically acclaimed as the finest and quietest ever produced. It is a new listening experience that will virtually make you feel as if you were in the studio with the band. The nicest thing you can do for your stylus and ears. So, sit back, relax, enjoy the music, and remember the sound. 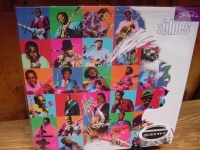 As part of the numerous compilations issued in conjunction with the major television documentary series The Blues, this is a collection of blues-oriented Hendrix recordings. There is a previous compilation of Hendrix's blues-oriented work in 1994, simply titled Blues. There is little repetition between Martin Scorsese Presents the Blues and Blues, though, and it works as a decent grouping of some of his bluesiest recordings for those listeners who want to plunge especially deeply into one facet of his repertoire. "Red House" and "Voodoo Chile" are by far the most celebrated tracks here. The fine Earl King cover "Come On (Let the Good Times Roll)" (from Electric Ladyland) is the only other song that came out in Hendrix's lifetime The other selections vary from inspired ("Hear My Train a Comin'," recorded in early 1969 with the original Jimi Hendrix Experience lineup, and a solo "Midnight Lightning") to straight ahead jams, with Hendrix's imaginative virtuosity and affinity for the blues evident. This being a posthumous Hendrix release, it couldn't be complete without a couple of previously unissued tracks to tempt the completists, Those are the 1969 outtakes "Georgia Blues," on which Hendrix is actually more like a backing musician for Lonnie Youngblood (who takes lead vocals), and "Blue Window," a nearly 13-minute outing that gives vent to his jazzier tendencies, the arrangement also featuring organ, three saxophones, and two trumpets. The liner notes about Jimi's blues record collecting habits by mid-'60s girlfriend Faye Pridgon are pretty cool. 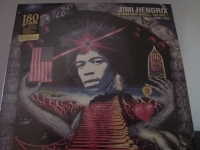 A must for Hendrix LP lovers. 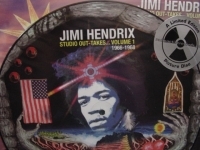 "Jimi Hendrix, Studio Out-Takes, #89 - Volume 3 1969-1970 - 180 Gram"
JIMI HENDRIX - STUDIO OUT-TAKES...VOLUME 3 1969 - 1970 A Numbered Limited Edition #89 - 180 Gram LP - 3,000 Pressings This Heavy Vinyl LP is a listening experience that will virtually make you feel as if you were in the studio with the band. The nicest thing you can do for your stylus and ears. 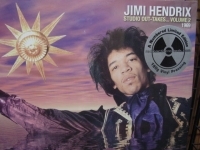 This, the third of the 3-volume series of rare Jimi Hendrix studio out-takes, finds the guitarist back in America and recording at Electric Ladyland and The Record Plant. We are again invited to follow Hendrix as he endeavors to fashion loose musical ideas into developed songs or frameworks for his electrifying live jams. These tracks very much reflect the artist at work in the studio, and is yet another illuminating glimpse into the creative process of probably the greatest guitarist of our time. Side 1: 1. Valleys of Neptune - recorded at the same session as Freedom, this instrumental starts out as if it's destined to become a great track until Hendrix playing blithely away admits half way through that he hadn't thought up an ending yet. 2. Freedom - This alternate version featuring a different set of lyrics, is one of 19 takes recorded with Billy Cox and Mitch Mitchell at The Record Plant in 1970. 3. Bleeding Heart - Originally recorded in March 1970 at The Record Plant with an un-named drummer and no bass player. The over-dubs, with Mitch Mitchell, Billy Cox and Juma Sultan were added later. This is an alternate mix of an unused take. This sound on this track is particularly good. 4. Midnight Lightning Jam - From the July 14, 1970 Electric Ladyland sessions with Billy Cox, Mitch Mitchell and Juma Sultan. This is very much a work in progress which becomes more than apparent as the track unravels after a few minutes which is most unfortunate as what we do get to hear sounds terrific. 5. Drifters Escape - A basic track recorded at Electric Ladyland on June 17, 1970 with Mitch Mitchell and Billy Cox. This version, which sounds absolutely superb, has three lead guitar parts. 6. Send My Love To Linda - Another track recorded during many sessions at The Record Plant, this one having taken place on January 16, 1970. This is the second take of a new song that unfortunately was never completed. Side 2: 1. Astro Man - Instrumental backing track (take 7) recorded in June 1970 at Electric Ladyland with Mitch Mitchell, Billy Cox and Juma Sultan. Different versions appear on First Rays Of The New Rising Sun and in the Experience Hendrix Box Set. 2. Lover Man - A track from May 1970 recorded at The Record Plant. 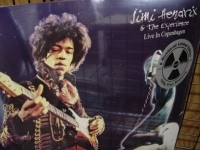 Previously unreleased until two alternate versions (one recorded at Olympic and a later one at Electric Ladyland) were included in the Experience Hendrix Box Set. 3. Earth Blues - Recorded at The Record Plant in December 1969 with Juma Sultan, The Band of Gypsies and The Ronnettes, this alternate mix is one of 16 takes and features totally different guitar parts. 4. Room Full of Mirrors - Recorded with The Band of Gypsies and with the Ghetto Fighters (Hendrix's long-time friends Arthur and Albert Allen) on backing vocals on November 17, 1969 at The Record Plant. This version is an alternate unused mix with extra guitar parts. Hendrix was constantly searching for a unique sound and this, coupled with the fact that he disliked the sound of his own voice, meant that many versions were rejected, much to the amazement and frustration of engineers Tony Bongiovi and Tommy Erdelyi. "Jimi Hendrix, The Rainbow Bridge Concert - The Late Show Vol. 2 - #d 180 Gram"
JIMI HENDRIX - THE RAINBOW BRIDGE CONCERT - THE LATE SHOW Analogue Pressing - Numbered - Limited Edition Pressing of 5,000 pieces - 180 Gram Heavy Vinyl LP - On July 30, 1970, an audience of around 400 were privileged to attend two impromptu performances by the world's greatest rock guitarist, Jimi Hendrix. This album, featuring the second of Hendrix's performances at Rainbow Ridge (ChuckWein, director the Rainbow Bridge movie commented "even though it was called Rainbow Bridge, it was known as Rainbow Ridge, because that's the name of the ridge on which the concert was held"), provides us with a glimpse of what future recordings might have been like had he lived, as well as what Jimi was truly capable of on stage. The film eventually featured only a small amount of live footage, and the '70s soundtrack actually included no music from the concert at all. Available for the first time in 32 years, this is the complete performance of the second of the two concerts, both of which feature Jimi at the peak of his incredible powers. Tracks include: Dolly Dagger - Instrumental - Ezy Rider - Red House - Freedom - Jam Back At the House - Land of the New Rising Sun. Listen to tracks like Instrumental and Jam Back at the House, the latter containing a short sample from the song Straight Ahead (a track which would later appear on one of the many posthumous albums) woven in, as well as a stagger version of Red House which should be in any Hendrix fan's collection. "Jimi Hendrix, The Rainbow Bridge Concert, The Early Show - #d 180 Gram"
JIMI HENDRIX - THE RAINBOW BRIDGE CONCERT - THE EARLY SHOW Analogue Pressing - Numbered LPs - Limited Edition of 5,0000 pieces pressed - 180 Gram Heavy Vinyl LP - On July 30, 1970, an audience of around 400 were privileged to attend two impromptu performances by the worlds greatest rock guitarist, Jimi Hendrix. The movie Rainbow Bridge, directed by Chuck Wein, tracks the journey of one character across the Pacific to Maui, Hawaii, with Hendrix's music intended to serve as a back drop to the film and the awesome Hawaiian scenery. The film eventually featured only a small amount of live footage, and the 1970s soundtrack actually included no music from the concert at all. Available for the first time in 32 years, this is the complete performance of the first of the two concerts, both of which feature Jimi at the pea of his incredible powers. Tracks include: Lover Man - Hey Baby - In From the Storm - Message to Love - Foxy Lady - Hear My Train A Comin? - Voodoo Chile - Fire - Purple Haze. 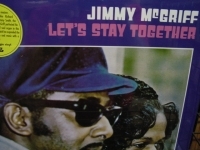 "Jimmy McGriff, Let's Stay Together - 180 Gram Vinyl"
180 Gram Limited Edition Analog Virgin Vinyl. A master of the Hammond Organ, Jimmy takes his own spin on classic soul tunes by artists such as Isaac Hayes & Al Green, and twists them to his own unique style that launched a new style of soul-funk. 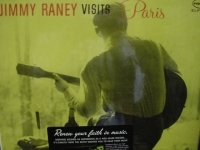 Tracks Include: "Let's Stay Together" "Tiki" "Theme from Shaft" "What's Going On" "Old Grand Dad" "Georgia on My Mind" "April in Paris"
Audiophile 180 Gram Limited Edition Analog Virgin Vinyl. Tracks Include: "Jazzville Vol.1" "The Modern Art Of Jazz" "Let's Talk About Love" "The Modern Art Of Jazz (Vol.2)" "I'll Take Romance" "A Message From Garcia" "Jazzville Vol.2" "Les Jazz Modes" "The Kid From Denver" "Cohn On The Saxophone." 180 Gram Limited Edition Analog Virgin Vinyl. Tracks Include: "I'm Tired Of Crying Over You" "Blue Bird" "Walkin' By Myself" "Rock Me" "I Lost A Good Woman" "Howlin' For My Darling" "Why Are You So Mean To Me" "Blues Falling" "Lemon Squeezer" "That Ain't It (Baby I Need Your Love)" "Smokestack Lighting" "Blue And Lonesome" "Big Boss Man." 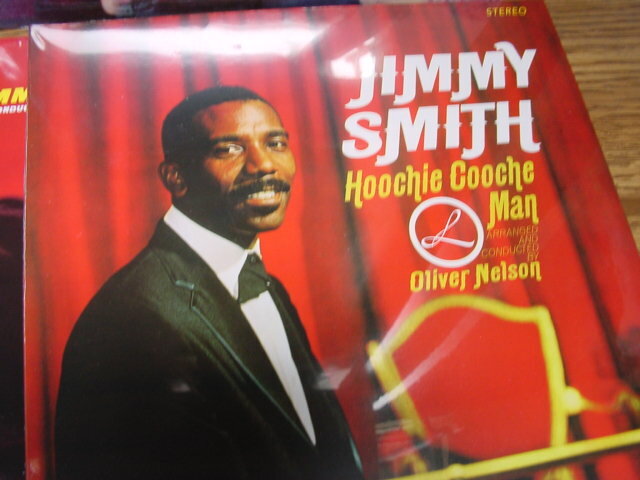 "Jimmy Smith, Hoochie Cooche Man - 180 Gram"